Onryō, The Ghost Of An Evil Torturing Revenge! Many different cultures have made their home in America and around the world, and so have the evil ghosts and demons that have followed them. My stern warning here is more then simple. "Ghost Hunter Be Ware!" Onryō (怨霊) is a evil Japanese ghost who is thought by many to have extreme supernatural powers over the living. And the most evil is which is that they are able to return to the physical world whenever they so desire. And this is to seek exacting evil vengeance upon those they despise and curse. These ghosts are never more happy then when they are torturing their ex living lovers, husbands and their families to the point of insane madness or death. These terrifying horrid ghosts are often mostly female and will do everything from stealing a mans virility to causing him or his new love break up, or push them to the point to kill themselves. This the ghosts strange evil acts, will directly openly punish them brutally for what they were caused in life by the living lover. And as the living lover falls into deep depression, fear, remorse and desperation as they believe they are so certainly due. While male onryō ghosts do exist, they are mainly found in the art of kabuki, But they they do exist. Many of these ghosts take extreme delight in watching the living fall into great despair. These ghosts will by any means make sure that no one is happy in the world of the living. Onryō will often wait a few days or weeks sometimes a month or two before attacking their victims outright. This is because many tales say they sit back and watch the results of their death on the living. The seriously despise and harm those that do not truly morn their passing. Often the majority of Onryō that haunt the living are solely of evil women. Though such ghosts are thought by many today to come back often and actually curse or haunt family lines through out their many generations. These ghosts are the ones that are feared during any month of the year but they become more aggressive in their haunting's during Hungry Ghost Month. Often when the person is alive they are powerless in effecting or changing the relationship they are in, That which is in the physical world, they often suffer great shame and abuse from their lovers. In death they become strong and or able to see the lies and pain that their living lovers caused them. These individuals have become ghosts of this type because often they die at their lovers hands or because of them commit the horrible act of suicide. The traditional Japanese spirit world is very deeply layered, with Yomi on one extreme, and the physical world on the other. located somewhere in-between is a sort of ghost filled purgatory, an uncertain and ambiguous waiting area where spirits go over their lives before moving on. Ghosts in this in-between state who are filled with very powerful emotions from a lost love, jealousy, hatred or sorrow can bridge the gap back to the physical plane where they can haunt and wreak havoc on their once earthly tormentors. While driven by their desire for vengeance, they rarely follow the Western ideals of justified revenge. For example, several tales involve abusive husbands, but these husbands are rarely the target of the onryō's vengeance. How a Man's Wife Became a Vengeful Ghost and How Her Malignity Was Diverted by a Master of Divination - A neglected wife is abandoned and left to die. She is transformed into an onryō, and torments a local village until banished. Her husband remains unharmed. Of a Promise Broken - A samurai vows to his dying wife never to remarry. He soon breaks the promise, and his former wife's onryō beheads the new bride. Furisode - A heartbroken woman curses her famously beautiful kimono before dying. After, everyone who wears the garment soon dies. Possibly the most famous onryō is Oiwa, from Yotsuya Kaidan. In this story the husband remains unharmed; however, he is the target of the onryō’s vengeance. Oiwa's vengeance on him isn't physical retribution, but rather psychological torment. The appearance of an onryō and other yurei had no particular appearance. However, with the rising of popularity of Kabuki during the Edo period, a specific costume was developed. Highly visual in nature, and with a single actor often assuming various roles within a play, Kabuki developed several visual shorthands that allowed the audience to instantly clue in as to which character is on stage, as well as emphasize the emotions and expressions of the actor. White and indigo face make-up called aiguma. Onryō will often attack the friends of those of the person the loves as well as direct family members that might have objected to to them being with the person they loved. Jealousy seems to be a driving force as well as the fact that some parents and friends who do not like the person their son or daughter is involved with. These ghosts will go to many great lengths to seek out direct vengeance on those around this person. So often it is believed that by killing the living lover or not. The Onryō is notorious for setting up situations to have a new lover or the persons family suffer great loss by murders, suicides or horrible disfiguring accidents. The Onryō will often infect a persons dreams. To often appearing in the dreams of those connected with the person they loved but not that person who hurt them directly. Mothers of the sons who have hurt this woman or young girl in life or often the direct targets. As are new girl friends and their close fiends. The person who the Onryō loved is often not targeted no matter if they sought to hurt the Onryō in life or not. The revenging ghosts only want to see them suffer great heartache. These ghost are not ever easily sent back to the grave they often resurface soon after being exorcised from any location or persons life. Those that study the phenomena to any degree often will suffer the wrath of such ghost if they try to dispatch them from a location. Many who exorcise ghosts fear these types of ghosts because when trying to help a victim who is haunted by one, they to become the victims very soon after. I have known many people who are tortured by what they believe to be is a real ghosts attacking them. They the haunted often believe the ghost actually came into their life because of a location they moved into or a haunted item they have bought. But in my experiences of paranormal research and communications with many ghosts, it so seems that more then not these evil beings that taunt and punish the living are purely after hurting someone they once were associated with. 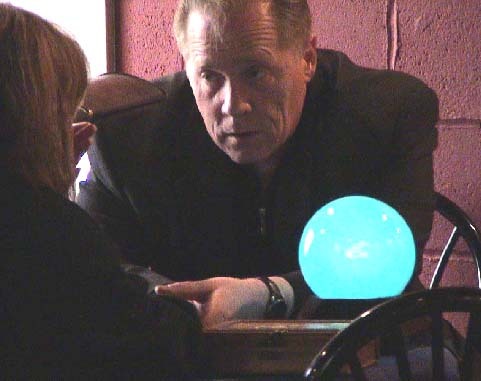 Many today in the field of paranormal research over look such traditional aspects of ghosts and believe it is only a spirit wanting to communicate through EVP's or demonic forces at work. Onryō are ghost that cry or even cuss when questioned through the standard methods of EVP collection. Many might mistake a ghost of this type as one being trapped or crying out for help. The truth is the vengeful aspects of the Onryō might truly be at work and those that study a ghosts motives overlook the obvious. This ghost is using anything at its grasp to to outright harm you physically and mentally. Onryō are ghost that many believe fully manifest their images of their once full body in ghost encounters. As many believe full body apparitions or not that common in documentation but these strange paranormal phenomena's or often recounted and spoken of by the truly haunted. Onryō are often also associated with the paranormal phenomena of producing of real solid apports. Many who encounter them often speak of finding items that the dead person once had in their possession that were lost. these ghost gifts often appearing in their homes in common locations unexpectedly. the reason the ghost leaves them is often a subject of debate. some believe it is to give the ghosts victim a chance to redeem themselves. Or might it be to give a family member a strong clue to why they are being haunted in the first place. The Onryō it seems does not care if it haunts a person that they think is at the root of their problems. They also seem to seek out those very far away and even slightly remotely involved with a person they curse and haunt. 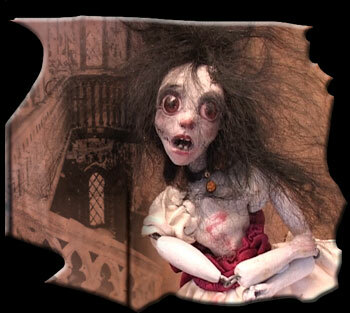 One of Annabel Lee's dolls is available (here). The primitive/antiqued ghost dolls are one of a kind hand made cloth creations. Annabel and Ratgirl are 18 inches tall (46cm) and quite distressed due to a diet of rats, bugs, death and of course accidental singeing (by Annabel's Ogre's eyeball) in Ravensbreath Castle. The other ghost dolls vary in size but are similar. BABY is about 12 inches high and in a sitting position with movable arms and legs (and a full nappy). Their bodies and faces are hand painted and disressed, as one would expect from fading ghost children. Some of them have ears made of clay. Baby's ears are cloth. In Ratgirl's case her ears are painted pink and her hair is white mohair. She also has a long pink rat tail and white whiskers. Her mouth was accidentally sewed shut in the Orgre's Eyeball incident. All the dolls arrive in a grunged cloth sack with Ravensbreath logo patch. They come with a history card which has also been singed by the evil eyeball. All dolls are signed, singed and dated. All dolls are bendy and can sit on the bed next to you. You can see Annabel Lee in her deathday suit below. Like all the ghost children's rag dolls, this is a collector's piece and only a very few will ever be made. They have small parts so are not suitable for young children as toys.